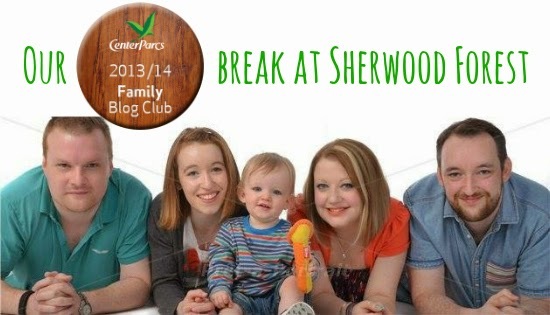 Last week, we went on a break to Center Parcs Sherwood Forest and had a fantastic five days together as a family. We've been to Center Parcs on three occassions now, including a recent weekend break to Whinfell Forest, and we were so excited to be going again as part of the Center Parcs Family Blog Club and because we really enjoy everything that's on offer to us during this kind of holiday. I've also visited one of the Aqua Sana spa's, but that's a whole different story - watch this space for details of my most recent visit later this week. The great outdoors. The fun activities. The stylish lodges. It's hard to decide what we like most but whatever it is, it's become an annual break for us now. Hubs, Ethan and myself were joined by my sister-in-law Erin and her fiancé Rob on this occasion and neither of them had been to Center Parcs before. We were staying for five days / four nights in a three bedroom lodge within the Oak area of the village, not far from the centre. We arrived on Monday afternoon and after exploring the village centre and enjoying a Starbucks, we moved into our lodge and got settled in. Ethan even started walking, whilst holding onto the coffee table, for the first time, so we knew we were in for a week to remember. We then went to collect our cycles before exploring the village a little more then that evening, we went to Hucks for dinner. On Tuesday, we decided to spend the morning cycling and getting to know Sherwood Forest better then after lunch, we headed to the Subtropical Swimming Paradise. Ethan had lots of fun splashing around and Erin adn Rob enjoyed the rapids and flumes. I cooked for us that evening as we were worn out after a busy fun filled day. On Wednesday, it was my 30th birthday. Yep, I'm in my thirties now, no going back! Hubs had decorated the lodge for me before I got up and over breakfast, I opened my cards and presents. I wanted to have a relaxed day so we all pottered around, cycling to the village and chilling at the lodge before going out for dinner at Strada. We had such a lovely meal. The staff were friendly and attentive, making helpful suggestions for ordering food for Ethan and surprising me with a decorated table and a rendition of 'Happy Birthday' with my dessert. The food was great and we had a really nice evening, topped off with some cocktails back at our lodge. I had to be up bright and early on the Thursday as Ethan had a pottery class called Fun Pots With Tots. We got to chose which item we wanted to paint and then he was let loose on the paints. He had a coverall and a booster seat and lots of paints and brushes to play with. I must admit I did help paint the base coat before letting him unleash his inner artist, and he did very well indeed. He found it really fun and it was great to see him so excited. We left his finished gnome to be collected fully glazed the next day, and met with everyone else. We went over to the sports centre and we went to a family photo shoot, where we got lots of group, family, couple and individual shots taken. It was amazing how in just 20 minutes we got so many fantastic photos and we're certainly going to have trouble choosing which ones to go for! They are quite expensive, depending on what size and what type of print or canvas you want, but there is a photo included in the cost of the session and I am sure we will want to choose one or two others. Either way, it was a nice thing to do and a great way to capture the memory of our holiday. It was then time to head to the other side of the village for Laser Clay Shooting, which the others enjoyed while Ethan and I watched on. It was a really good session and the boys enjoyed it in particular - they certainly got a bit competitive with everyone! We were hungry so headed to Dexters Kitchen for a burger before a quiet evening at our lodge. It had been a really busy day! Friday was checkout day so I got up early to cook everyone breakfast. We packed our things, cycled to the centre, dropped off our bikes then collected our cars before loading everything from the lodge. We waved goodbye to Erin and Rob then the three of us headed for a last visit to the village. It was such a fun, relaxing and memorable break - we really couldn't have asked for anything more. Even the weather was nice for the whole week! So, if you watched the video, you'll know we had an amazing time and all of us enjoyed what Center Parcs had to offer, whether we had been to stay before or if it was our first time. In addition to today's post, tomorrow I will be sharing my top five things to do at Center Parcs. If you haven't been before or you're planning your break now, I hope this will be useful to you. So, why do we love Center Parcs so much? I've said it many times to many people but it really comes down to the fact that you can do as much or as little as you like. There's something on offer for everyone of any age and you can be as active or as relaxed as you want to be. Because the village has everything you need, you can really relax and escape from it all and I really can't stress enough how easily I de-stress when I stay at Center Parcs, from the second I arrive. Everything is incredibly well thought out, the village has everything you need, the surroundings are just beautiful and there's so much to do. Accommodation: I love the lodges and the one we stayed in at Sherwood Forest was no different. Spacious and with a stylish décor, the lodges let you enjoy creature comforts whilst also being close to nature. Village: Sherwood Forest has an open plan, outdoor village as opposed to the indoor village centres at the other parks we have stayed at. This really made it feel like a village and it was pleasant to walk around. The rest of the park is well worth exploring as there are so many different areas, from the lake and beach to the playgrounds and sports centre. By foot or by bike, I can never get bored of enjoying the village. Shops: We always make a stop at Just Kids - this year we took home Ethan's new teddy friend Oakley Merryman - and I love The Store Room, which sells lots of lovely home nic naks. The on-site supermarket is really good too, with lots on offer and reasonable prices for the most part (perhaps just bring your own alcohol!). Activities: There are too many to list! Whether you want to make the most of the great outdoors, learn a new skill or pass the time on a rainy day, there's something to suit sporty and creative types alike. Our group really enjoyed the laser clay shooting and little ones are catered for too - we took Ethan to a pottery class this time but as he gets older, there's lots of things we'd like to do with him, particularly the nature experiences. My top tip is to book things in advance for the most part, not because you won't be able to get in when you want to but because it's useful to plan your holiday before you go and to work out what kind of things you would like to do and when. All-round holiday destination: Brilliant. Just a fantastic break that I really don't think you can get anywhere else in the UK. If you're looking for a break in beautiful surroundings and with something on offer to keep every member of the family happy, I couldn't recommend Center Parcs enough, Family Blog Club member or not. I can only imagine how much more fun we can have as a family as Ethan gets older and we are already thinking ahead to next year when we would like to visit the newly opened Woburn Forest. The theme song for Center Parcs at the moment is Best Day of My Life by American Authors and it really encapsulates the feeling of going on one of these breaks. Excitement. Quality time. Fun. If you'd like the chance to join the Tots100 and Center Parcs Family Blog club, look out for the monthly challenges - July's task can be found here.